Happy New Year and Full Moon blessings to all! What a day! What a year! 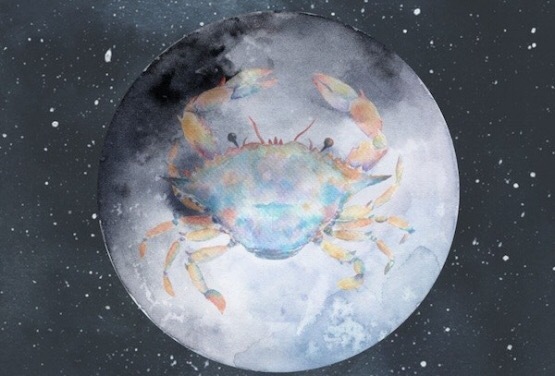 Today is the annual Full Moon in Cancer, and this one is also a Supermoon. The Knight of Cups is one of the biggest fan favorites, signalling love on its way to some. But, you know me, I have a different take on this, especially today. Today’s Knight of Cups is a bit of a daydreamer, and why not; today is a holiday for pretty much everyone. And, even those who are working may indulge in a little bit of daydreaming as the New Year gets under way. Tomorrow, Uranus will end its retrograde, meaning that there will be ZERO retrograde planets until March 8 when Jupiter retrogrades. You will want to be very busy in the coming weeks, pursuing all of your dreams and projects. The Universe is giving you a green light to move ahead and make them all happen. So, today, go ahead, kick back, relax and dare to dream. If you can dream it, you can achieve it! This entry was posted in Card of the Day, General Tarot, Love and Finance, Patreon, Readings, YouTube Videos and tagged Card of the Day, Guidance, Knight of Cups, Path, Reading, Tarot. The Seven of Fire represents the development and use of one’s intuition to see the way forward, and predict possible outcomes. Intuition is that gut feeling – it is an instinctual or unconscious knowing – that, when you heed it, can keep you safe from making mistakes, and lead you to being in the right place at the right time. It is a feeling of recognition that we often ignore, but if we choose to heed, can have us moving through life in harmonious accord with our surroundings. In actively using and then trusting your intuition on a regular basis, you may find you observe more, and in turn, you learn more. You start to see and take notice of signs and messages along the way. You take notice of those little inexplicable coincidences and moments that keep repeating, and, if you heed them, can take you on an adventure of discovery, revealing not only the truths you seek, but also your reason for being. Using and heeding your intuition can lead you to opportunities and experiences that offer the potential to both fulfill you and inspire others. However, to trust in one’s intuition requires that you look within and determine what the message means to you personally. You can ask advice of another. You can seek guidance from another. But only you know your answers. Personal interpretation is key. Trusting in the knowedge that is stored within your unconscious mind is key. Third parties can offer insight, but they can see and understand life through eyes that have been shaped and influenced by their own experiences, not yours. Only you know what something means for you, specifically. Only know if something is right for you. The Seven of Fire represents a need to actively develop or trust in your intuition and instincts at this time. Look around you. Observe. Speak to the cards on a regular basis, and honor the truths revealed by going where your intuition leads you. 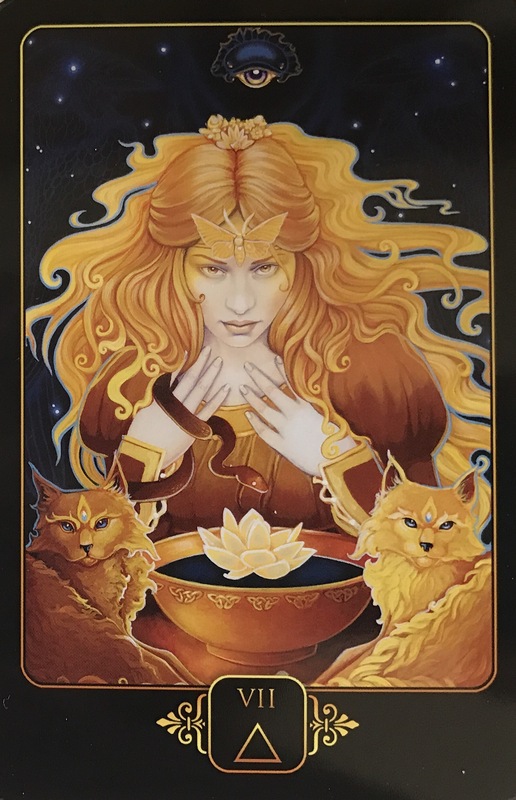 This entry was posted in Artist, Deck Review, Featured Card of the Day, General Tarot, Readings and tagged 7 of Fire, Dreams of Gaia, Ravynne Phelan, Tarot. Happy New Year, everyone! Today is New Year’s Eve, and the fireworks and celebrations will begin with our Aussie friends at midnight, and end many hours later as 2018 is rung in around the globe. You are probably looking at the 10 of Swords as the Tarot Card of the Day and saying “UGH”! Do not let yourself be fooled. I truly feel the darkest days, the most stressful days are over now, and have been. It is always said things are darkest before the dawn, and that you need to bottom out, before rising to the top. 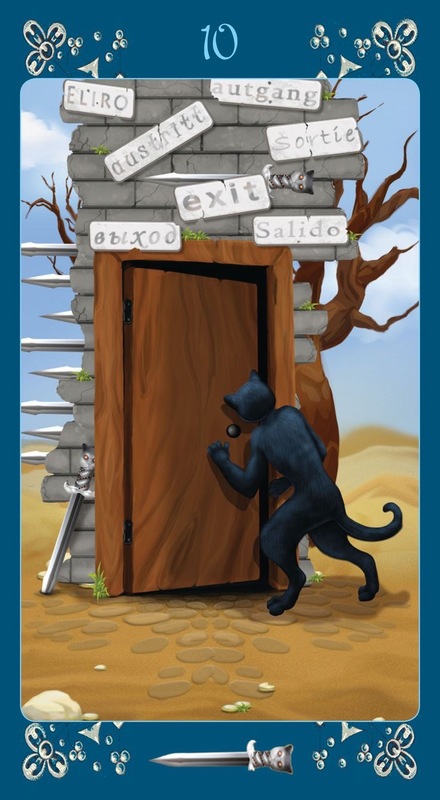 This depiction from the Black Cat Tarot is so appropriate with its door. Brighter days are on the horizon. See that Exit sign? Go ahead, step through the door, and on into 2018! 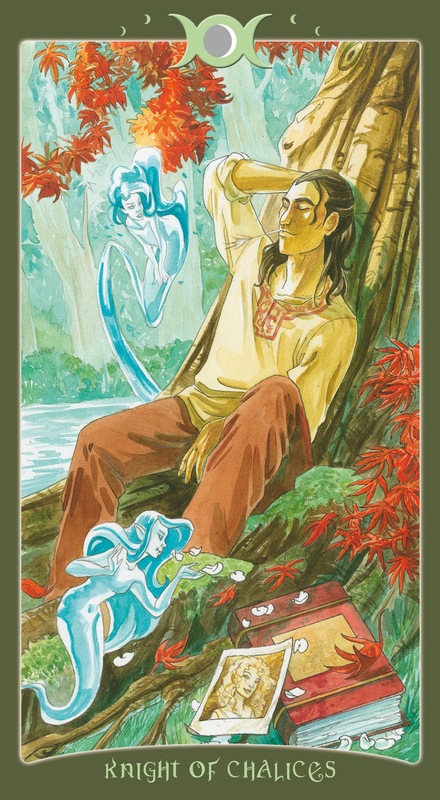 This entry was posted in Card of the Day, General Tarot, Love and Finance, Patreon, Readings, YouTube Videos and tagged 10 of Swords, Card of the Day, Guidance, Path, Reading, Tarot. This Supermoon Full Moon in Cancer falls on the first day of the week, month, and year. Go ahead, take a look back at all of the changes you have been through, the victories you have achieved, and the battles you have won. It may have felt like a bumpy ride, but look at this place where the Universe has brought you. The potential for manifestation is great now, and the Universe has at least one good trick up its sleeve designed to help you make it all happen. Energy is running high, and positivity abounds, making this a very unique time. Your clarity grows greater by day, as you strive to organize your life and utilize all of your acquired wisdom to create your vision for change. 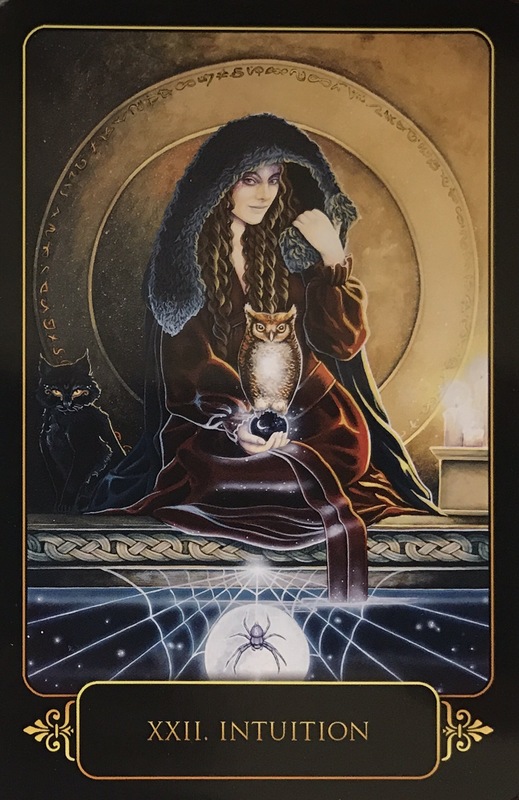 You are capable of life-altering decisions now, and as you look back during this Full Moon, prepare to let go of the past which is done and dusted. The Universe is saying look forward, it has your back, and your efforts will be generously rewarded with the cycles of the Moon. Work diligently with this energy to accomplish as much as you possibly can. Face forward, without fear, without doubt, and trust that you know what to do now. You are once again in charge of your life, and more than able to put things back on track. As you focus on any direction changes you feel may be in order, note the process of creation is in your hands. 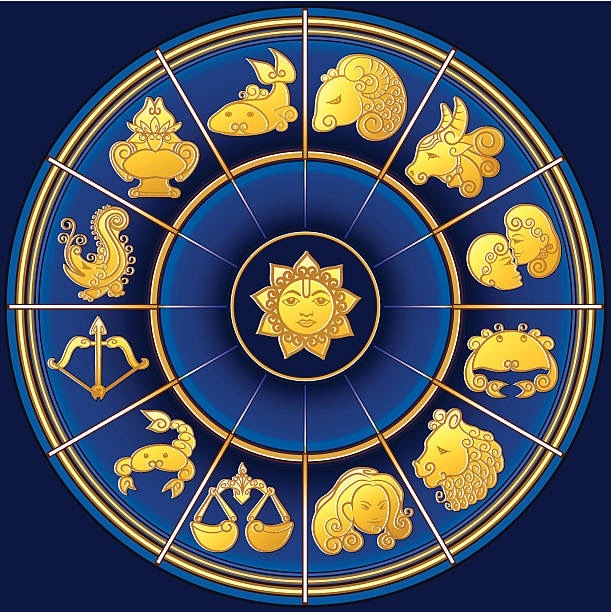 There is much abundance to be had, and your payoff appears to be coming some time around March, as you see your plans beginning to come to fruition in a very positive manner. I have prepared a special, in-depth Tarot Guidance, 21:22 in length, available exclusively through Patreon https://patreon.com/tarotbycecelia/ as part of a $5 per month pledge, which includes 15-20 other videos per month, as well as for purchase through YouTube. Don’t forget to check out my Saturn in Capricorn and 2018 Tarot Guidances available at the $10 Patreon tier, or purchase through YouTube. This entry was posted in Full Moon, General Tarot, Love and Finance, Patreon, Readings, YouTube Videos and tagged Cancer, Full Moon, Guidance, Path, Reading, Tarot. This entry was posted in General Tarot, Love and Finance, Patreon, Readings, Weekly Tarot Guidance, YouTube Videos and tagged Guidance, Path, Reading, Tarot, Weekly. – Intuition? Or bad past experiences? There are many words and phrases used to describe the subject of the sixth influence card, Intuition – that ‘funny feeling’, an ‘inkling’, a ‘sneaking suspicion’, a ‘hunch’, a ‘knowing’, a ‘feeling in one’s bones’, a ‘gut feeling’, a ‘premonition’, a ‘presentiment’, and a ‘foreboding’. It is inexplicable. You cannot pinpoint why you feel or believe as you do – you just know it in your gut and every fiber of your being demands that you listen. What is intuition? Intuition is your sixth sense. Intuition is a knowing or gut feeling that you experience without fully understanding the logic, or reason behind the feeling. It might defy rational thought or explanation, but you want to trust it, nonetheless. Intuition is a bridge between conscious and unconscious minds, between instinct and reason. It is your unconscious mind communicating with you. It can come to you in a flash of insight or feeling, or you can have an intuitive experience within a dream or daydream. It is also something quite often experienced during creative endeavors. In fact, most creative endeavors are better for being intuitive. Intuition is knowing that something needs to be done – not knowing why it needs to be done, but trusting and doing it anyway. Why? Because our intuition provides solutions. Have you ever walked into a room and instantly felt a certain vibe? Or met someone you are at ease with from the very first moment, and felt like you have known them forever? Have you ever had that feeling that something is not right, or too good to be true? Have you ever heard the phone ring, and known before answering who it was? This is your intuition – your sixth sense – at work, but how strong your intuitive abilities are is dependent upon how often you use them. Do you trust that gut feeling or knowing? Or do you push it aside as illogical and irrational? To have a strong intuitive ability and to use it has nothing to do with the paranormal or supernatural. Would it surprise you to know that there is a lot of legitimate research, including studies by the U.S. Navy, into how intuition works, and how it can be strengthened to help in situations where intuitive thinking may save lives? Some of the greatest scientific discoveries have been in moments of intuitive insight – Archimedes, Isaac Newton, And Frederick Kekulé all followed their intuition. Albert Einstein believed that intuition was of great value, when it came to innovation and invention. It is very easy to dismiss the intuitive feelings and thoughts that come to us, but your sixth sense is no different from your other senses. It is there to be used, and incorporating it into your everyday life will only enhance it. 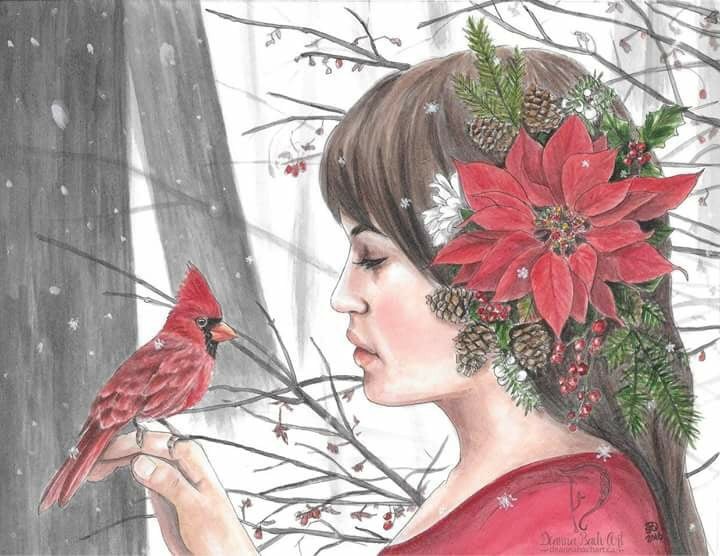 This entry was posted in Artist, Deck Review, Featured Card of the Day, General Tarot, Readings and tagged Dreams of Gaia, Intuition, Ravynne Phelan, Tarot.